The distribution needs to be uniform only for table sizes that occur in the application. In particular, if one uses dynamic resizing with exact doubling and halving of the table size s, then the hash function needs to be uniform only when s is a power of two. Here the index can be computed as some range of bits of the hash function. On the other hand, some hashing algorithms prefer to have s be a prime number. The modulus operation may provide some additional mixing; this is especially useful with a poor hash function. Cryptographic hash functions are believed to provide good hash functions for any table size s, either by modulo reduction or by bit masking. They may also be appropriate if there is a risk of malicious users trying to sabotage a network service by submitting requests designed to generate a large number of collisions in the server's hash tables. However, the risk of sabotage can also be avoided by cheaper methods (such as applying a secret salt to the data, or using a universal hash function). A drawback of cryptographic hashing functions is that they are often slower to compute, which means that in cases where the uniformity for any s is not necessary, a non-cryptographic hashing function might be preferable. Perfect hashing allows for constant time lookups in all cases. This is in contrast to most chaining and open addressing methods, where the time for lookup is low on average, but may be very large, O(n), for some sets of keys. As the load factor grows larger, the hash table becomes slower, and it may even fail to work (depending on the method used). The expected constant time property of a hash table assumes that the load factor is kept below some bound. 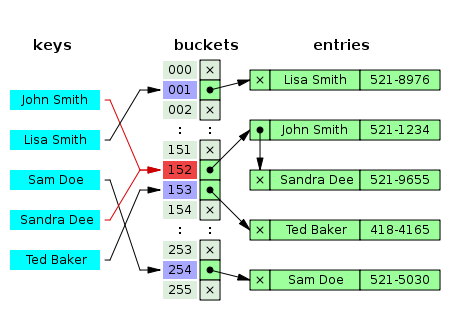 For a fixed number of buckets, the time for a lookup grows with the number of entries and therefore the desired constant time is not achieved. Ultimately, used sensibly, any kind of hash table algorithm is usually fast enough; and the percentage of a calculation spent in hash table code is low. Memory usage is rarely considered excessive. Therefore, in most cases the differences between these algorithms are marginal, and other considerations typically come into play. 2-choice hashing employs two different hash functions, h1(x) and h2(x), for the hash table. Both hash functions are used to compute two table locations. When an object is inserted in the table, then it is placed in the table location that contains fewer objects (with the default being the h1(x) table location if there is equality in bucket size). 2-choice hashing employs the principle of the power of two choices. The good functioning of a hash table depends on the fact that the table size is proportional to the number of entries. With a fixed size, and the common structures, it is similar to linear search, except with a better constant factor. In some cases, the number of entries may be definitely known in advance, for example keywords in a language. More commonly, this is not known for sure, if only due to later changes in code and data. It is one serious, although common, mistake to not provide any way for the table to resize. A general-purpose hash table "class" will almost always have some way to resize, and it is good practice even for simple "custom" tables. 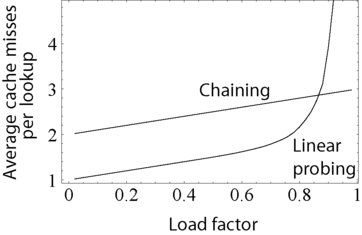 An implementation should check the load factor, and do something if it becomes too large (this needs to be done only on inserts, since that is the only thing that would increase it). To keep the load factor under a certain limit, e.g., under 3/4, many table implementations expand the table when items are inserted. For example, in Java's HashMap class the default load factor threshold for table expansion is 3/4 and in Python's dict, table size is resized when load factor is greater than 2/3. Since buckets are usually implemented on top of a dynamic array and any constant proportion for resizing greater than 1 will keep the load factor under the desired limit, the exact choice of the constant is determined by the same space-time tradeoff as for dynamic arrays. 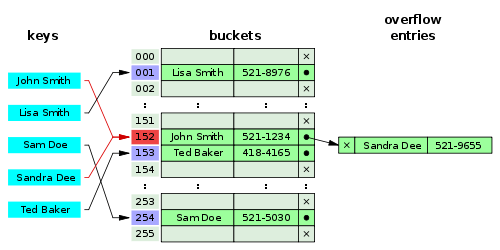 Resizing is accompanied by a full or incremental table rehash whereby existing items are mapped to new bucket locations. To limit the proportion of memory wasted due to empty buckets, some implementations also shrink the size of the table—followed by a rehash—when items are deleted. From the point of space-time tradeoffs, this operation is similar to the deallocation in dynamic arrays. 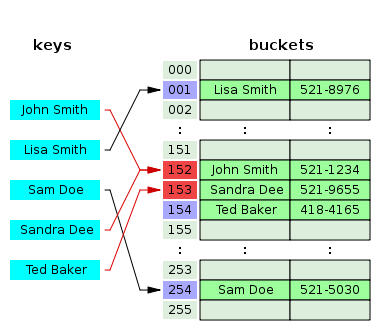 Disk-based hash tables almost always use some scheme of incremental resizing, since the cost of rebuilding the entire table on disk would be too high. In the simplest model, the hash function is completely unspecified and the table does not resize. For the best possible choice of hash function, a table of size k with open addressing has no collisions and holds up to k elements, with a single comparison for successful lookup, and a table of size k with chaining and n keys has the minimum max(0, n − k) collisions and O(1 + n/k) comparisons for lookup. For the worst choice of hash function, every insertion causes a collision, and hash tables degenerate to linear search, with Ω(n) amortized comparisons per insertion and up to n comparisons for a successful lookup. Adding rehashing to this model is straightforward. As in a dynamic array, geometric resizing by a factor of b implies that only n/bi keys are inserted i or more times, so that the total number of insertions is bounded above by bn/(b − 1), which is O(n). By using rehashing to maintain n < k, tables using both chaining and open addressing can have unlimited elements and perform successful lookup in a single comparison for the best choice of hash function. In more realistic models, the hash function is a random variable over a probability distribution of hash functions, and performance is computed on average over the choice of hash function. When this distribution is uniform, the assumption is called "simple uniform hashing" and it can be shown that hashing with chaining requires Θ(1 + n/k) comparisons on average for an unsuccessful lookup, and hashing with open addressing requires Θ(1/(1 − n/k)). Both these bounds are constant, if we maintain n/k < c using table resizing, where c is a fixed constant less than 1. If the set of key-value pairs is fixed and known ahead of time (so insertions and deletions are not allowed), one may reduce the average lookup cost by a careful choice of the hash function, bucket table size, and internal data structures. In particular, one may be able to devise a hash function that is collision-free, or even perfect (see below). In this case the keys need not be stored in the table. For certain string processing applications, such as spell-checking, hash tables may be less efficient than tries, finite automata, or Judy arrays. Also, if there are not too many possible keys to store -- that is, if each key can be represented by a small enough number of bits -- then, instead of a hash table, one may use the key directly as the index into an array of values. Note that there are no collisions in this case. In PHP 5, the Zend 2 engine uses one of the hash functions from Daniel J. Bernstein to generate the hash values used in managing the mappings of data pointers stored in a hash table. In the PHP source code, it is labelled as DJBX33A (Daniel J. Bernstein, Times 33 with Addition). SparseHash (formerly Google SparseHash) An extremely memory-efficient hash_map implementation, with only 2 bits/entry of overhead. The SparseHash library has several C++ hash map implementations with different performance characteristics, including one that optimizes for memory use and another that optimizes for speed. SunriseDD An open source C library for hash table storage of arbitrary data objects with lock-free lookups, built-in reference counting and guaranteed order iteration. The library can participate in external reference counting systems or use its own built-in reference counting. It comes with a variety of hash functions and allows the use of runtime supplied hash functions via callback mechanism. Source code is well documented. uthash This is an easy-to-use hash table for C structures. The idea of hashing arose independently in different places. In January 1953, H. P. Luhn wrote an internal IBM memorandum that used hashing with chaining. Gene Amdahl, Elaine M. McGraw, Nathaniel Rochester, and Arthur Samuel implemented a program using hashing at about the same time. Open addressing with linear probing (relatively prime stepping) is credited to Amdahl, but Ershov (in Russia) had the same idea. ↑ Cormen, Thomas H.; Leiserson, Charles E.; Rivest, Ronald L.; Stein, Clifford (2009). Introduction to Algorithms (3rd ed.). Massachusetts Institute of Technology. pp. 253–280. ISBN 978-0-262-03384-8. 1 2 3 Knuth, Donald (1998). 'The Art of Computer Programming'. 3: Sorting and Searching (2nd ed.). Addison-Wesley. pp. 513–558. ISBN 0-201-89685-0. 1 2 Cormen, Thomas H.; Leiserson, Charles E.; Rivest, Ronald L.; Stein, Clifford (2001). "Chapter 11: Hash Tables". Introduction to Algorithms (2nd ed.). MIT Press and McGraw-Hill. pp. 221–252. ISBN 978-0-262-53196-2. ↑ Pearson, Karl (1900). "On the criterion that a given system of deviations from the probable in the case of a correlated system of variables is such that it can be reasonably supposed to have arisen from random sampling". Philosophical Magazine, Series 5. 50 (302). pp. 157–175. doi:10.1080/14786440009463897. ↑ Plackett, Robin (1983). "Karl Pearson and the Chi-Squared Test". International Statistical Review (International Statistical Institute (ISI)). 51 (1). pp. 59–72. doi:10.2307/1402731. 1 2 Wang, Thomas (March 1997). "Prime Double Hash Table". Archived from the original on 1999-09-03. Retrieved 2015-05-10. ↑ Probst, Mark (2010-04-30). "Linear vs Binary Search". Retrieved 2016-11-20. ↑ "How does a HashMap work in JAVA". coding-geek.com. ↑ Askitis, Nikolas; Zobel, Justin (October 2005). Cache-conscious Collision Resolution in String Hash Tables. Proceedings of the 12th International Conference, String Processing and Information Retrieval (SPIRE 2005). 3772/2005. pp. 91–102. doi:10.1007/11575832_11. ISBN 978-3-540-29740-6. ↑ Askitis, Nikolas; Sinha, Ranjan (2010). "Engineering scalable, cache and space efficient tries for strings". The VLDB Journal. 17 (5): 633–660. doi:10.1007/s00778-010-0183-9. ISSN 1066-8888. ↑ Askitis, Nikolas (2009). Fast and Compact Hash Tables for Integer Keys (PDF). Proceedings of the 32nd Australasian Computer Science Conference (ACSC 2009). 91. pp. 113–122. ISBN 978-1-920682-72-9. ↑ Willard, Dan E. (2000). "Examining computational geometry, van Emde Boas trees, and hashing from the perspective of the fusion tree". SIAM Journal on Computing. 29 (3): 1030–1049. doi:10.1137/S0097539797322425. MR 1740562. .
1 2 Tenenbaum, Aaron M.; Langsam, Yedidyah; Augenstein, Moshe J. (1990). Data Structures Using C. Prentice Hall. pp. 456–461, p. 472. ISBN 0-13-199746-7. ↑ Herlihy, Maurice; Shavit, Nir; Tzafrir, Moran (2008). "Hopscotch Hashing". DISC '08: Proceedings of the 22nd international symposium on Distributed Computing. Berlin, Heidelberg: Springer-Verlag. pp. 350–364. ↑ Celis, Pedro (1986). Robin Hood hashing (PDF) (Technical report). Computer Science Department, University of Waterloo. CS-86-14. ↑ Goossaert, Emmanuel (2013). "Robin Hood hashing". ↑ Amble, Ole; Knuth, Don (1974). "Ordered hash tables". Computer Journal. 17 (2): 135. doi:10.1093/comjnl/17.2.135. ↑ Viola, Alfredo (October 2005). "Exact distribution of individual displacements in linear probing hashing". Transactions on Algorithms (TALG). ACM. 1 (2,): 214–242. doi:10.1145/1103963.1103965. ↑ Celis, Pedro (March 1988). External Robin Hood Hashing (Technical report). Computer Science Department, Indiana University. TR246. ↑ Litwin, Witold (1980). "Linear hashing: A new tool for file and table addressing". Proc. 6th Conference on Very Large Databases. pp. 212–223. ↑ Doug Dunham. CS 4521 Lecture Notes. University of Minnesota Duluth. Theorems 11.2, 11.6. Last modified April 21, 2009. ↑ Alexander Klink and Julian Wälde's Efficient Denial of Service Attacks on Web Application Platforms, December 28, 2011, 28th Chaos Communication Congress. Berlin, Germany. ↑ Mike Lennon "Hash Table Vulnerability Enables Wide-Scale DDoS Attacks". 2011. ↑ "Hardening Perl's Hash Function". November 6, 2013. ↑ Crosby and Wallach. Denial of Service via Algorithmic Complexity Attacks. quote: "modern universal hashing techniques can yield performance comparable to commonplace hash functions while being provably secure against these attacks." "Universal hash functions ... are ... a solution suitable for adversarial environments. ... in production systems." ↑ Bar-Yosef, Noa; Wool, Avishai (2007). Remote algorithmic complexity attacks against randomized hash tables Proc. International Conference on Security and Cryptography (SECRYPT) (PDF). p. 124. 1 2 Mehta, Dinesh P.; Sahni, Sartaj. Handbook of Datastructures and Applications. p. 9-15. ISBN 1-58488-435-5. Tamassia, Roberto; Goodrich, Michael T. (2006). "Chapter Nine: Maps and Dictionaries". Data structures and algorithms in Java : [updated for Java 5.0] (4th ed.). Hoboken, NJ: Wiley. pp. 369–418. ISBN 0-471-73884-0. McKenzie, B. J.; Harries, R.; Bell, T. (Feb 1990). "Selecting a hashing algorithm". Software Practice & Experience. 20 (2): 209–224. doi:10.1002/spe.4380200207.